in the hopes that St. Nicholas would soon arrive and use his advanced knowledge of science and technology to break into your house. OK, perhaps Santa won’t pull a total Ocean’s Eleven style heist, but let’s face it, most burglars use the door or window when trying to infiltrate your home. It takes a special kind of crazy to try to break into a house, totally unseen, through the chimney. Luckily, Santa keeps up to date with his weekly Sketchy Science reading, and understands how to use the laws of nature to craft the ultimate stealth entrance. The first hurdle Santa needs to overcome is ensuring the reindeer-powered flight to your home is totally undetectable. Since the 1940’s, radar technology has been used by the military to track objects moving on land, air, and sea. As radar technology becomes more advanced, so does the technology used to thwart it. A radar blasts out a high powered radio wave and waits for it to bounce off of things and come back to the receiver - kind of like an echo. When surfaces are round, like a typical airplane fuselage, part of the wave will reflect back to the receiver, making it very easy to spot. Stealth airplanes, on the other hand, have very sharp, angled, and pointed surfaces, which deflect the radio waves and scatter them in many different directions. They are also made of materials which help to absorb the radio waves. 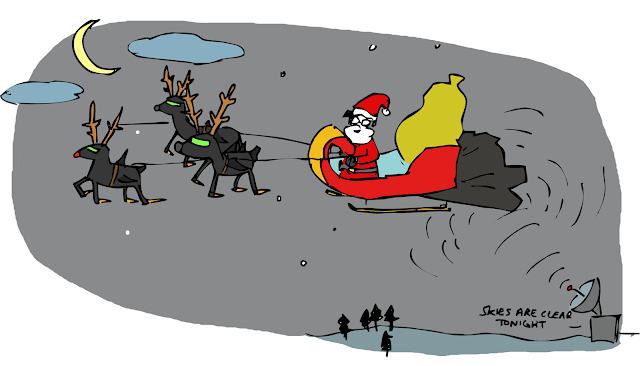 With some slight modifications to his sleigh, Santa can easily deflect most of the radar, while I’m sure his top notch R&D team has investigated the configuration of reindeer fur which best maximizes radar wave absorption. Now that santa is able to get around at altitude without being spotted, how does he manage to land on the roof undetected? Could Santa become invisible to the naked eye? There are already successful examples of invisibility paneling (https://www.youtube.com/watch?v=HqwxNQyFbZA), which essentially place cameras all around the object meant to become invisible, then project each image onto LCD panels on the opposing side. Each LCD panel shows an image of whatever is directly behind it, creating the illusion of invisibility. While these invisibility panels work well for nice, planar surfaces, like Santa’s stealth sleigh, how would he go about hiding the reindeer? In these cases, it’s best to use flexible materials which are able to distort light. In fact, a team at UC Berkeley have created an 80 nanometer thin material that can be wrapped around odd shaped surfaces and make them invisible in certain wavelengths of light (http://www.latimes.com/science/sciencenow/la-sci-sn-tiny-invisibility-cloak-gold-metamaterial-20150917-story.html). 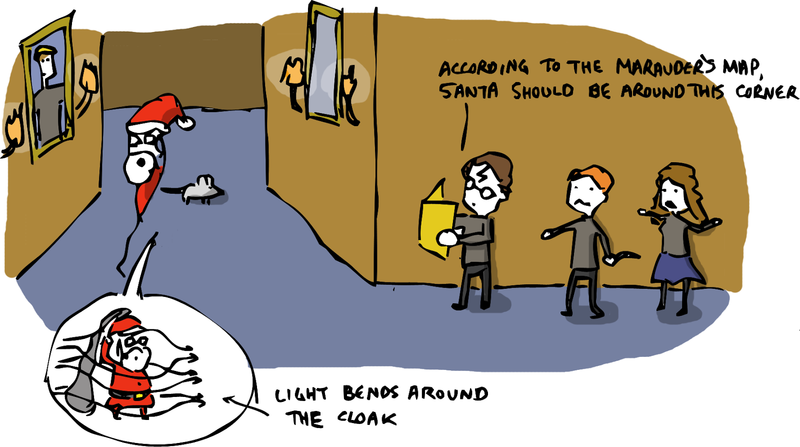 This technology can be used to make invisibility cloaks for the reindeer or Santa himself, though unlike Harry Potter, Santa doesn’t need magic to make his stuff work. If only Hogwarts taught classes in nanomaterials. With Santa safely on the rooftop undetected, how does he manage to squeeze his portly body down the chimney? This seemingly impossible feat is made possible by the highly skilled elves at the north pole who specialize in genetic engineering, and managed to splice some octopus DNA in with Santa’s. Without the burden of bones or air sacks, octopi upwards of 600 pounds are able to fit through holes the size of a quarter (http://www.huffingtonpost.com/2010/11/01/octopus-weighing-600-poun_n_775632.html). With that kind of squeezing savvy, Santa could get into your house through a poorly sealed window, let alone a gaping chimney-sized hole in the roof. Once inside, all he has to do now is drop off a few presents in complete silence. So, how does he manage to creep around without making a peep? Of course, there are some military grade sneaking shoes he could use, which help to absorb sounds when creeping about, however, such technology wouldn’t help with creaky floor boards. Instead, Santa opts for a more complete solution, such as a hoverboard made from liquid nitrogen cooled superconductors (http://www.wired.com/2015/06/lexus-hoverboard-slide/). Such a device leverages the Meissner effect, which describes how placing a superconductor near a magnetic field induces an electric current, which in turn creates a magnetic field around the conductor. The two magnetic fields interact and apply opposing forces on each other, allowing Santa to levitate off the ground and hover around the living room. It should be noted, however, that for the hoverboard to work, the floor needs to also contain some kind of magnetic material. While that’s not typically the case for carpeted or hardwood floors, let’s just say Santa and his team have a far advanced understanding of material science and has figured that one out. With the presents safely and silently delivered under the tree, Santa can now relax and enjoy some of the delicious eggnog and baked goods left out on the counter. However, with the all the cookies he inevitably eats along his nightly journey, hopefully he’s aware of any nutmeg added to all the delicious food he’s consuming, as in high doses, nutmeg can actually act as a hallucinogen (http://www.compoundchem.com/2014/03/24/the-hallucinogen-in-your-kitchen-the-chemistry-of-nutmeg/). Such a misstep would be disastrous to his otherwise perfectly executed stealth mission. 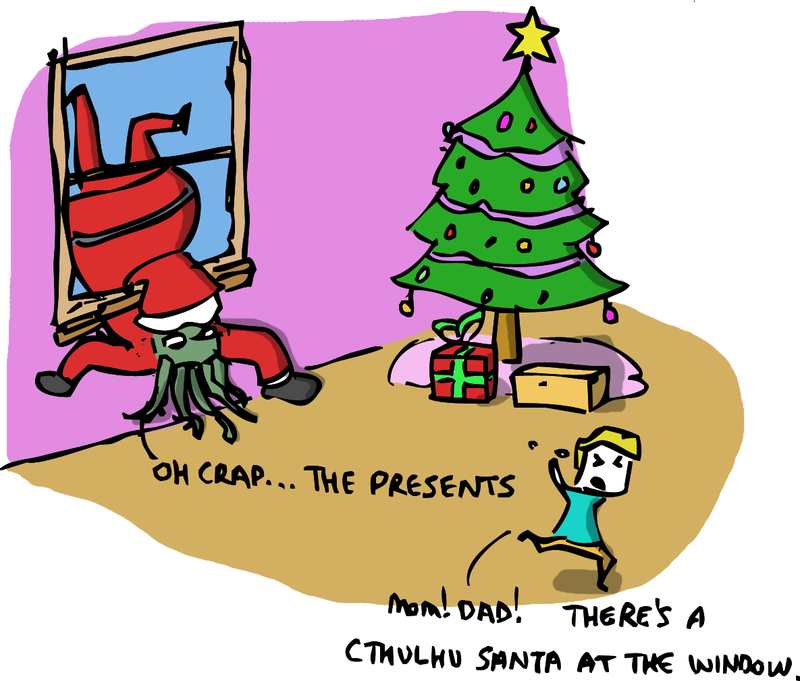 hopefully you don’t find Santa Claus arguing with your christmas decorations. That is an interesting concept to talk about the Christmas for making it even more exciting. I would be really excited to see if someone is doing the same in my house on this event.